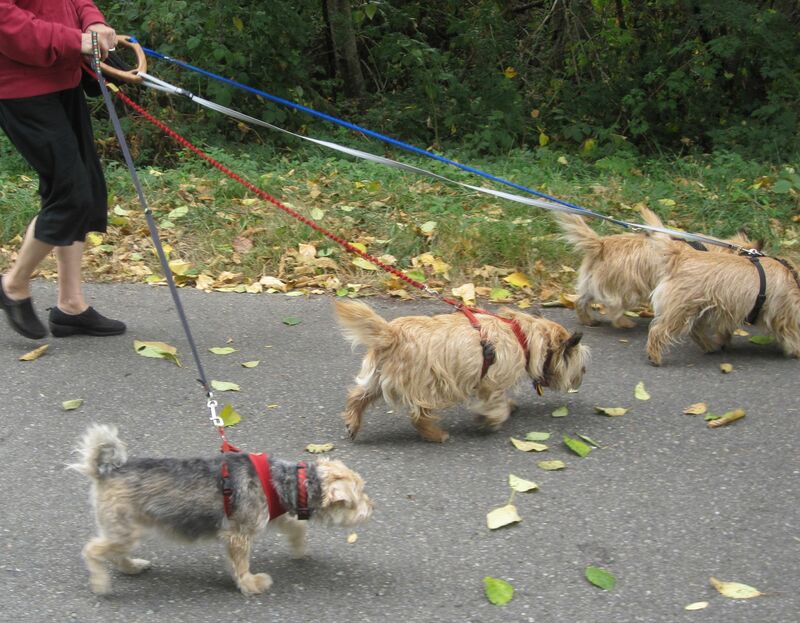 UTURN HANDLES LLC - Walk 2, 3 or even 4 dogs at the same timeand untangle all leash tangles in secondswhile walking! Makes it great fun. ***May 26, 2015: Due to webhost changes weregret that only the homepage is currentlyavailable. The other sections of the websitewill be added again within two weeks.In the meantine please order via Amazon, Etsyor Ebay. Please view the videos to understandhow the untangling is done by turning or flippingthe handle (in seconds and while walking). Walk 2, 3 or even 4 untrained dogs together AND enjoy it! Are your dogs difficult or impossible to walk together? Ideal for walking untrained or partially trained dogs that tangle a lot, NOT needed for well-trained dogs! Works best when the dogs are eager to walk upfront (and pull a little). Works best with each dog in a harness that has the leash-connecting ring on top (back). How does the UTurn handle work? Please view some of the following YouTube videos. "U Turn it U Untangle it In Seconds While Walking"
One half turn/flip (180 degrees) with the handle removes one LEASH entanglement in one second! We apologize for the quality of the videos. These are our amateur videos. There is some duplication. They also don't show how easy it is to untangle while walking 3 dogs but you can get a good idea of how the untangling works. Walking with 3 is easy. Walking with 4 untrained dogs is doable but is (as shown in the video) often slow and much more work. Running/jogging with 4 is not recommended due to the tripping danger (for the handler and the dogs). As shown above the UTurn handle has 3 grips, 3 leash attachment holes and a large central opening. This simple triangular design makes it possible to untangle all LEASH entanglements* (which amount to approx. 80% of all tangles) in seconds while walking. You do this via half turns/flips with the handle. One half turn/flip (one 180 degree rotation) for each entanglement. One half turn/flip moves one triangle corner roughly to a position in-between the other two corners and this untangles one tangle between two leashes. When the order of your dogs in front changes, you simply move your hand to the next best grip. Fast untangling while walking was never possible before. It makes walking 3 dogs, even untrained, partially trained or a mix of trained and untrained dogs suddenly doable! Of course turning the handle is WORK as you need one half turn for each entanglement. If your dogs entangle often, you turn the handle often. But you and the dogs can keep on walking*. Walking 3 dogs with the handle is easy (after you get the hang of the untangling and the dogs get used to it) but even FOUR dogs is possible although a much bigger challenge due to the separate fourth leash. Caveat: The handler untangles all LEASH tangles* (between the 3 leashes/dogs =80% of all tangles) while walking by turning the handle, but the handler cannot untangle the remaining 20% of tangles which are handler/leg or external object entanglements. These are still a nuisance and require special action, see more below. The UTurn Handle is the only tool you need. Use it with your own leashes. It is sold without leashes. 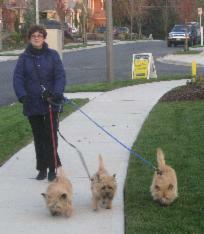 We use the handle ourselves every day to walk our 3 cairn terriers. It works! And it's fun. The dogs love it too: Way fewer stops*, and they all get lots of space and don't jerk each other around. *What is meant with 'LEASH' entanglements/tangles? 1) LEASH tangles/entanglements, also called internal leash tangles, are defined as the tangles between the 3 dogs/3 leashes themselves, not with anything else. These comprise 80% or more of all possible entanglements. All of these LEASH tangles can be untangled while walking by turning the handle, no matter how many times a leash is entangled with another leash. Each leash entanglement takes one half turn (180 degrees) or flip with the handle. 3) External-Object entanglements (with a tree, post, another person, other object, other person's leashed dog(s), etc.). To resolve 2) and 3) it's best to stop and take special action. To get out of these special entrapments, see the advice in the Use Product and FAQ chapters. By being able to untangle ALL leash tangles in seconds while walking, walking 3 dogs suddenly became much easier and even fun. It's still WORK (=not automatic): You will turn the handle a lot especially if you have master tanglers! But you can now walk with full confidence by knowing that you can always untangle all leash tangles. That confidence remains, even if there are handler/leg entanglements. And the more you use it, the more you and the dogs will tune in to each other and the better it will go. You will also become better at escaping or avoiding some of those annoying handler entrapments or wrap-arounds. To avoid those handler tangles it helps a lot to keep on walking, i.e. do not pause or stand still and get distracted. If you stop then the dogs will encircle you one or more times and often within seconds. You will find out! It also helps if your dogs like to walk upfront and like to pull a little (are eager to go). We found that being able to untangle all LEASH tangles (i.e. 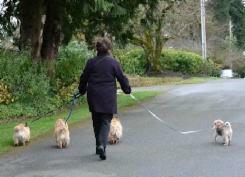 the 80%) while walking makes walking any team of 3 dogs doable! For us it was impossible to walk our 3 dogs together without the handle. The dogs would get the leashes entangled too often or encircle us way too fast. They would do that again and again within seconds. If you have tried it, you know the nightmare! With the handle you can walk 3 dogs easily and even walk 4 untrained dogs (if not too powerful) at once which is totally impossible with 4 separate leashes. 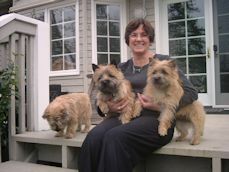 Anybody who has tried to walk 2, 3 or 4 untrained or half-trained dogs at once UNDERSTANDS how difficult it really is. It is often impossible! How can the handle help? Is the handle suitable for me and my dogs? The UTurn handle is a new and very strong product for dog owners and dog walkers who want to walk 2, 3 or 4 dogs with one person. We do not sell leashes as you can use your own leashes. The handle can make a unique present for a family member or other relative, or a friend or neighbor who has 3 or more dogs, or who is a dog walker. Recommended for walking small and small to medium size dogs. It can be used with larger well-behaved dogs provided they are leash-trained and can be controlled despite their combined pulling power. The U-Turn handle is not an ordinary leash handle. It's a 3-grip controller/detangler/untangler and also very strong. It is made in one single piece and testing has shown the material is over 5 times stronger than the best hardwood and will not break. Is the handle not recommended in certain cases? On the opposite end, it may not work for tiny dogs that do not like to walk in front or are too weak to pull. The detangling is easier with some tension on a leash but that is not absolutely necessary. It cannot untangle a small dog that crosses under and between front and rear legs of a large dog. It is not needed for a team with 3 well-trained dogs that do not entangle (much), or when the owner does not want the dogs to walk in front or does not want the dogs to unlearn the side-by-side walking on shorter leashes they were trained in or are going to be trained in. It should NOT be given as a gift to a dog owner who has well-trained dogs or who does not want to walk 3 or 4 dogs at the same time. Is the handle 'ideal' for walking 3 or 4 dogs? b) 100% automatic untangling where the handler and the dogs do not need to do anything. However (a) Training 3 or 4 dogs to walk obediently together is very hard. And (b) Fully automatic untangling using 3 or 4 dogs/leashes (with swivels or swivel systems) is impossible. The UTurn handle is somewhere in-between 'impossible' and 'ideal': It does make walking 3 or 4 dogs with one person possible, and even fun, but it definitely is work for the handler. The handler does the untangling of the leash tangles (up to 80% of all tangles, depending on the team) by rotating the handle. The handler still needs to resolve the other (handler/leg and external object) entanglements if there are any (20% of all tangles). This 80% makes it doable and fun, that 20% is still a big nuisance. This 80% however is enough to make walking 3 dogs with 3 leashes on the handle much easier than using 3 separate leashes or using a 3-way coupler, and also much easier and more pleasant for the dogs. See under FAQ (14) for more information on how to TEST your own primitive home-made handle and try the untangling with 3 tangled leashes yourself before ordering. You can test the untangling without dogs, e.g. with the help of a second person. You hold the home-made handle with the 3 leashes. This second person then entangles the leash ends, pulls the leashes tight(er) and holds them in the entangled state with the ends somewhat apart, then you untangle them with the handle. Try one or two tangles first, then try more. Untangle often = Try to keep the dogs/leashes untangled while walking! Untangle as soon as you see one or two entanglements appear. Then the untangling is by far the easiest. It gets progressively harder when you let more and more entanglements build up, e.g. 5 to 10 (and even harder - but still possible - after some of the leashes finally start to wrap around the handle itself). It's surprisingly fun to keep the leashes untangled because you will see how your dogs appreciate it ---> they (and you) can keep on going! Feedback in the form of a customer/product review on Amazon is most helpful for our small company. Please order on Amazon on the link to our Amazon page above. Do NOT order on this website via any of the 3 (handle) icons below. In Canada do not order from GUM Inc or others; they order from us and then double or triple the price.